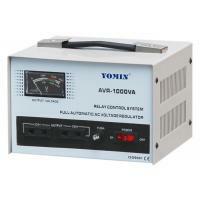 1000VA Automatic Voltage Regulator , AVR Stabilizers With Wide AVR Range . AVR Automatic AC home voltage stabilizer is composed of automatic coupling regulator,sampling control board,executing mechanism.It has the characteristics of in volume,light weight,little in distortion output wave from,quick in react etc,it is especially suitable for household air conditiner,refrige rate,TV setand music center.It also can leng their use span,and so is the ideal-ist AC,stabilizer for modern families. We have been specializing in manufacturing various automatic voltage regulator / stabilizer for almost 3 years . The superior quality of our products and excellent customer services help us earn good reputation among our customers from both home and oversea . We own full set of production equipment and technology and can make hardware , circuit board , coil , transformer and plug by ourselves . Our R & D staff always work hard , trying to meet our customers ' requirements . Our sales dept . is always offering their best and professional service to our customers . The quality of our products is strictly controlled on the production line .